Skateboarders are equipped for more obstacles than ramps and rails. They will skate in temperatures as low as 20 degrees Fahrenheit, as long as it’s not too windy or icy, according to Ohio State Skate Club President Jason Black. When the weather gets too extreme in Columbus, skaters find a haven in Skate Naked, an indoor skate park located at 3790 E. 5th Ave. This winter, the group plans to take biweekly trips to the park to stay in practice when the weather doesn’t allow for meetings. “We’re bringing in all the members that we have, or at least can fit in one car safely. It’s a really good place to go in the wintertime. Everybody goes, and there’s a lot of good people from around Ohio,” said Black, a third-year in photography. The OSU Skate Club, co-founded by Black and other members three years ago, meets on Mondays and Wednesdays from 4 to 6 p.m. in the parking lot in front of Orton Hall. 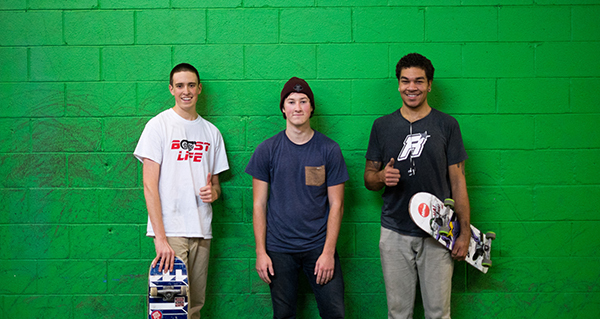 Besides offering shelter from the weather, Skate Naked challenges skateboarders with a variety of different obstacles, a contrast from the flat area the club practices on now. “For our members in the club, they can’t get that much better if they’re just skating the flat ground all day long. That limits us,” Black said. The group used to meet at a skate park on Kenny Road near Jesse Owens West, but it was removed in the spring of 2014. Members of the skate club said that the parking lot is their only other option, and sometimes they are forced out by police. “It’s like 50-50 whether or not the cop is cool and gets that we have nowhere to go or kicks us out,” said Cary Bauer, a fourth-year in finance and treasurer of the club. Running a skate-related business isn’t easy either. Owner of Skate Naked Adam Keeler said running the business has its costs and rewards. Embassy Boardshop at 3347 N. High St. has a satellite location inside Skate Naked, and employee Joseph Charlton said that the skate community keeps the business alive. “It’s still such a thriving community even in the winter. There’s always kids that need decks, shoes, etc. I’d say it’s a steady flow; we have a good loyalty,” Charlton said. Despite the park near OSU closing, Keeler added that he thinks the market for outdoor parks in Columbus is saturated, estimating 10 parks within a 15-mile radius. Even with other parks in the area, OSU Skate Club is still hurt by the loss of the skate park on campus. “It’s unfair to us that they pump so much money into other sports and areas, and they allow us to be a legitimate club through the university, but they still have people harassing us to leave and there’s nowhere we can go. Why provide a club for your students and then don’t give the resources to have the club?” Black asked. Still, Charlton noted that overall, skate culture is prospering in Columbus. “I’d say the community is as good as it’s been in a long time,” he said.